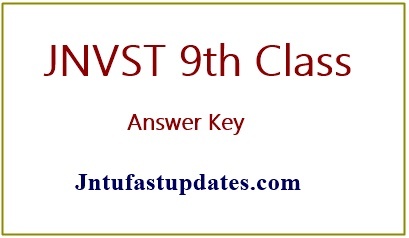 JNVST Answer key 9th Class 2019 : Jawahar Navodaya Vidyalayas (JNVs) has organized the class IX admission test on 2nd February as per the scheduled date. The JNV 9th Entrance test was organized in many examination centres across the Nation. Students seeking admissions in Navodaya educational organizations have applied for JNVST entrance test. Lakhs of hopefuls have competed for JNVST Class 9th Entrance test. The Jawahar Navodaya Vidyalayas is going to release the JNVST 9th Class Answer Key PDF for the accessibility of competitors. Aspirants competed for 9th Admission test can download JNVST 9th Class Answer key and estimate the score by comparing with the answers given in it. The answer key will be released in PDF format and it consists the answers for all sets A, B, C, D. Candidates can download the PDF file and compare with the answers from it. The official answer key will be shortly available on the official website, navodaya.gov.in. Students can keep visiting the official portal of JNVST to check the results. Navodaya 9th Class Entrance Test Answer key & Question Paper Solutions 2019: JNVs annually organizes the Jawahar Navodaya Vidyalaya Selection Test (JNVST) for students aspiring to get admission in class 9th. This is the national-level examination conducted in many places across India. Based on the rank and merit obtained by the aspirants, the admission will be offered in Navodaya Educational organizations. The Jawahar Navodaya Vidyalayas were functioning in many places across the Nation. At present, there are 626 functional Jawahar Navodaya Vidyalayas spread over 28 States and 07 UTs. In order to get admission in JNV, students have to qualify the admission test with good merit. Students who have come across the JNV Selection test for class 9th can download JNVST 9th class answer key PDF from the official website, navodaya.gov.in to calculate the answers and to estimate the score in the examination. Candidates those who will secure good marks and reached official cut off than those aspirants will be allowed to attend for next phase of the selection process of JNVST admission Examination. Answer key will be available for all sets and answers has been provided for each section Questions. If any on getting trouble with getting Answer key Page, they can try after some time. As the number of users increases, the server may get slow, so aspirants need to wait for a while and reload the Answer key Page. Navodaya IX Class answer key will be released within 3-4 days after the examination. Hence candidates need to stay patient until the answer key is released. Follow the below-given steps to download Navodaya IX class answer key 2019 PDF. Search for JNVST Answer key 2019. Go with an official link. What is the cut off of class 9 th general category?? Answer key kab ayegi ????? Sir jnvst class9 2019 ka result kab aayega? Answer key kb ayegi 2019 ki. When the results wii be declared ?